So begins the description of a route undertaken some one hundred and thirty years ago, I must admit these days just the thought of it makes me shiver just to think about it, twenty years ago maybe? Although it’s impossible to plot the exact route originally taken above is an estimated profile of the above walk which measured out to 20.8 miles. Also, remember back then such modern luxuries as Gortex coats, fleece jackets, waterproof over trousers, rucksacks and GPS were unheard of. A stout pair of leather boots along with a tweed coat, cap, scarf and gloves were probably the order of the day. So here is the account of the gentleman’s exploration which took place on November 5th, 1887 – just make sure you’ve packed your energy bars. 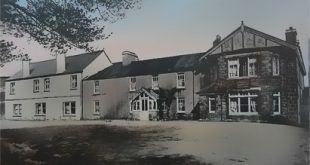 “We leave Okehampton at 8 o’clock, and ascend the hill at the back of the station, reach Fitz’s or the Holy Well on the top of the park, then just under the old Monk’s Pond on the top of the hill, leave the artillery road, and go through a gateway into the eastern end of the Park. Here a narrow track takes you by an old rustic bridge of a simple slab of granite over the Moor stream, and so to Halstock Farm – the Halstock of which so much has been written, and of which so many legends are extant alike of monk and monastery. We call upon the hospitable farmer, a Mr. Beavon (as good and true lover of sport and of a Dartmoor fox as can be found within 20 miles), and ask him where the site of the ancient Halstock Chapel is. “Well,” says he, “I don’t rightly know. I have heard tell how ’twas up here, and I’ve heard tell that more than 100 folks used to live here once; but ’twas long before my time, and I’ve known the place well a matter of 50 years or so. We often come across ruins, walls and fields, and once there in the mead I took up a stone and there was a regular heap of ashes like a chimney corner. There was a chapel here for certain, at least everybody says so; the Archdeacon always said so, but some folks say ’twas over the far side of my field – Chapel Hill field – and some think ’twas just at the gateway. We inspect both places, where certainly are clear indications of buildings, and although the ground is covered with turf, the outlines can be clearly seen. None of the buildings, however are true to the compass, all lying N.N.E., the sites in the distance being perhaps nearer, but not true east than the other. This fact rather militates against this being the true site of the chapel, for it is almost a universal rule that all religious houses of anything like ancient origin face east. In reply to our question Mr. Beavon says he has heard the water was taken in for the pond from the Moor stream, between rough Tor and Mill Tor, but it was before his time. An anonymous work, entitled ‘An Account of the Antiquities of Okehampton,’ deals very romantically with the chapel and the neighbourhood, but also fails to point out the identical spot. Mr Rowe, in his Perambulation also treats it as uncertain; and Mr. Beavon’s recollections goes beyond the date of both these works, it seems somewhat doubtful whether the locality was more clearly known then than it is at present. We descend the hill from through the Halstock Woods, over the Okement by the Chapel Ford, and by descending Belstone Tors in a S.E. direction pass the circle of stones known as the Nine Sisters or Stones, though composed of 17 stones, and eventually reach the river Taw, which we cross, and, still pointing in the S.E. direction, half an hour’s walking brings us to the top of Cawsand, or more properly Cosdon Hill (1,792ft. ), for many years considered the highest hill on Dartmoor, but more accurate recent measurement gives the palm to Yes Tor, which is accorded a height of 2,020 feet. On top of the hill are tow cairns, the larger being about 60 yards S.W. of the other. Rowe, in his ‘Perambulations’ refers to the fact that each of these cairns contained a kistvaen, but now all evidence of them has been removed. There is also a large circle of stones a little to the north east of the large cairn, and almost immediately between the two is a small heap of stones recently erected by the Ordnance Survey to mark the highest portion of the mountain. The view Cosdon (or Cawsand) commands is more extensive than can be obtained from any other point on the Moor, and the eye can sweep the country on three sides without interruption. On this occasion, however, a thick haze limits our vision, but the immediate neighbourhood stands out well, the Quarry Hills at South Tawton and Throwleigh Church and village being particularly noticeable. After enjoying the sight for some time we start taking a south-western direction striking over White Hill, on to Will Tor (Wild Tor), and thence on to Taw Head. Here a pack of black game – seven in number – rise almost at our feet, and as we cross the valley a solitary duck rises many gunshots out of our way. It is splendid walking, the ground for the most part is solid and firm; the fresh breeze now rising sweeps the Moor, bracing and rendering one able to do three times as much as in the muddy lanes of the in-country. At Taw Head we strike due west, and after about three-quarters of a mile of rough ground strike the well-known Cranmere Pool, which has been described in a previous ramble. From here our course is west by south, and half an hour’s walking takes us over the shoulder of Little Kneeset and the Tavy and its tributaries to Fur Tor, which stands out in all its grand proportions. Now the course is very simple. A trackway on the bank of the Tavy takes you along the side of the Watern Oak, through several stone circles (which are to be found by the side of the river on this tor) and over the Rattle Brook, and thence to Tavy Cleaves. The cleave is in ‘splendid form’ this afternoon, the ferns and bracken, lit up with the gleams of sunshine on the one side, is in strong contrast with the dark, solemn, and now almost beetling cliffs on the other. It is a view that no one can look upon without being moved. From the junction of the Tavy and the Rattle Brook, and going down stream, it has many features in common with the celebrated pass of Llanberis, for which North Wales is so celebrated. Certainly for grandeur of its kind there is nothing on Dartmoor at all approaching it. We have a long tramp home, and the afternoon is passing, so we start on our homeward tramp. Our course lies up the cleave to the Rattle Brook, then for about two miles in a N.E. direction, leaving the Peat Works on the right. The ground is rough and soft in many places, but about an hour’s walking brings you to the foot of Kneeset, at the junction of the small stream with the Okement – the united stream you cross and ascend the Dinger Tor. Now the sun, blood-red, is just sinking behind the heights of Hammicombe (Amicombe Hill), and red gleams of liquid fire seem every now and then to light up the wild hills we are travelling, and making them appear like huge volcanoes belching out their lurid flames. A mist is rising in the valley and the course of the Okement streams seem marked out with a filmy white veil, whilst every now and then the sliver streak of the waters as they dash over the rocks throw a life and vigour to the scene. It is a lovely and wonderful sight, and as strange as wonderful, but Dartmoor has always beauties fro those who woo and follow her sufficiently. The scene is so striking a one that we turn out of our course to High Willhags (High Willhays), and from one of its tors survey and admire it in silence. It is so absorbing that we scarce notice the darkness, and not until the sun disappears with a last fitful gleam are we brought back to our ‘work-a-day’ world with the unpleasant knowledge that we have to get over Yes Tor in darkness. Now, Dartmoor is a very awkward place to travel in the dark, for although you may get over the initial difficulty attendant on keeping in the right direction, yet the rocks, the holes, the bogs, and the pits are all serious impediments against anything like a fast or certain or safe progression. An accurate description of our homeward journey from this point, would, perhaps, be given by that well known line of Virgil :- Infandum regina jubes renovare dolorem (roughly translated means – O, queen, you bid me renew an unutterable grief). Suffice it to say that we did get down over Yes Tor and on to Black Down, and over to the Artillery camping ground, Okehampton Park, and so on to Okehampton without any serious damage.” – The Devon and Exeter Daily Gazette, November 5th, 1887. Makes one feel completely knackered just to read about the ‘tramp’. The author makes some interesting remarks about Halstock Chapel and I presume the ‘Monk’s Pond’ he mentions is the small flooded quarry just S.W. of East Hill? There is also an excellent example of how place-names can get changed, in this case what looks like a simple typo – ‘Willhags’ could easily find its way into being if one did not know the area. Additionally, as most people know, thanks to modern(ish) surveying equipment High Willhays is the highest point of Dartmoor. Sadly I think one would be very fortunate to see a ‘Black Game’ or ‘Black Grouse’ in Taw Marsh never mind seven! One thing I can easily relate to is overstaying ones welcome in a remote spot just as nightfall descends. It happened to me on Fur Tor and ended up walking across Taw Head in the dark whilst heading for Hangingstone Hill – certainly no joke.